ETAG – a good Bett for UK education? Navigation items within ETAG – a good Bett for UK education? A couple of months ago my daughter came home from school with an interesting new project: everyone in her year group was being asked to imagine what the classroom of the future might be like. After a few weeks of frantic activity, parents were invited to school to view the children’s creations. There were models made of papier-mâché, Lego, and even shoe boxes and old loo roll holders. 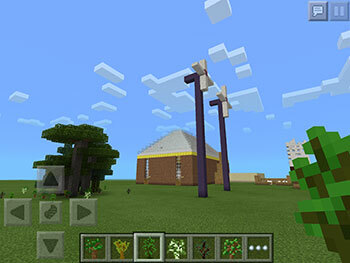 My daughter decided to make an entire model school in Minecraft on her iPad. Fast forward to late January 2015 and all eyes were on Bett 2015 this week, opened by education secretary Nicky Morgan - who also happens to be my constituency MP. In her speech, Nicky launched the report of the Department for Education’s independent think tank the Education Technology Action Group (ETAG). ETAG, chaired by Bournemouth University’s Professor Stephen Heppell, has also been imagining the classroom of the future. In this blog post I thought it would be interesting to compare their conclusions. A graphic by ETAG member Bryan Mathers from City and Guilds summarises the group’s perspective on what the learning landscape of 2025 (or perhaps even 2020) will look like. The ETAG report makes 19 pragmatic recommendations that the group believes will help us to prepare for this new reality. Some of these are principally about establishing a level playing field in terms of core infrastructure services, eg high speed internet connectivity and a safe, secure and resilient organisation-wide wireless network. These could be viewed as potential capital projects to ensure equitable provision across schools, colleges and universities. Alongside the pure technology plays, ETAG also make a number of recommendations that are about developing digital skills. For example: a “digital Duke of Edinburgh Award” scheme to inspire learners and enhance employability outcomes, and a programme of continuous professional development for staff which would showcase, reward and celebrate innovation in digital technologies. The group felt strongly that the voice of the learner should feature in all of this, such as digital residents from what they called the ‘iPad generation’. Talking to my own digital resident, I was struck by the fact that she had constructed a school which was practically a self-contained community, with technology seamlessly woven into its very fabric. Her school scored well on sustainability, with wind turbines and solar panels for power, and composting toilets. It had practically every wall usable as a screen, and of course all the children had tablets and computers at hand when required. At the same time the school also featured its own farm, growing vegetables and farming animals for the children to look after. At break time the children would collect eggs from the school chickens to give to the cook, and after some practice (and a few hints and tips) even I eventually learned how to dye a sheep in Minecraft – a vital skill that would sit nicely on any LinkedIn profile. As my daughter and I discussed her project, I was reminded of our Jisc Digital Festival, and last’s year’s keynote speaker Sugata Mitra’s School in the Cloud initiative, which is all about giving children just the right amount of encouragement to support their own self-directed learning. In a world where technology is ambient and ever present, learners can potentially range far and wide beyond the narrow boundaries of the material that is present in the school or college library, set texts and so on. For me the key message of the ETAG report is all about bringing the technology we now use every day into the classroom and lecture theatre. Albert Einstein once said “never memorize something you can look up”, and there is a real sense in which today’s digital technologies may well mark ‘the end of remembering’, as I recently suggested in Jisc’s technology foresight and horizon scanning activity. However, there is a big ‘but’ here: many learners do not have home broadband and access to a device of their own. I was therefore particularly pleased to see the ETAG report reference the Open University’s Your Own Technology Survey (YOTS) project, which is aimed at giving schools a snapshot of the technology that their pupils have access to – including whether they are allowed to bring their own device to school. YOTS is aimed at schools, but is just as relevant to colleges and universities. I hope to use it in the near future in collaboration with the FE Sussex college consortium to explore their options in connection with implementing the government’s targets for online delivery following last year’s FELTAG recommendations. I recently visited the Perry Beeches II Free School in Birmingham, and learned from pupils that they were able to use the school facilities for long periods outside of formal school hours. This gave them access to a comfortable and safe working space with state of the art facilities in what is one of the most deprived boroughs in the UK, and I was delighted that Perry Beeches was recently rated outstanding in all categories by Ofsted, with a 97% pass rate at A level. The ETAG report also looks at assessment, accountability and issues around collection of learner data and the uses to which it is put. This became a hot button topic after the failure of analytics firm InBloom. The scandal around InBloom led to the development of the Student Privacy Pledge, which now has 91 signatories including the likes of Apple, Google, and Microsoft, and the support of President Obama. I should mention in passing here that we recently launched a Jisc code of practice for learning analytics as part of our learning analytics co-design challenge. So there we are – do take a look at the ETAG report, and let us know what you think about its recommendations. As Stephen Heppell says in the foreword “this is not a time to stand still or to simply finesse the past”, but at the same time we have to square our enthusiasm for progress and continuous improvement with the realisation that it could easily mean ever-increasing workloads for teachers, lecturers and administrators. I will close by reiterating the report’s key messages about access and inclusion, much which could be facilitated centrally by a supporting agency, and bringing everyday technologies into the classroom and lecture theatre. What can universities learn from boarding schools' digital pastoral care systems?